It's a rainbow in a bowl! This dish makes a light-yet-hearty lunch or a great side dish. Feel free to experiment with different grains, vegetables and dressings! Rinse barley and add to a medium saucepan half full of water. Cook on low for 20 minutes, then add well rinsed lentils* and quinoa. Cook for 20-25 minutes longer til all grains are cooked. Drain and let cool. 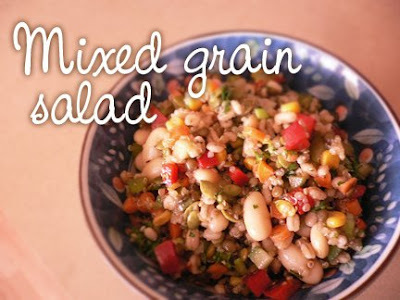 Combine grains with all the remaining ingredients. Mix well with the salad dressing. Serves 4. NOTE: French lentils cook in 20 minutes. If you substitute with other lentils (with the exception of red lentils which also cook in 20 minutes), start cooking them with the barley so they get a full 45 minutes to cook. I just made this and I love it! Thank you for this recipe.